Sheath liquid is a liquid for flow cytometer with the role to which the focus of the flow of cells are on a line. 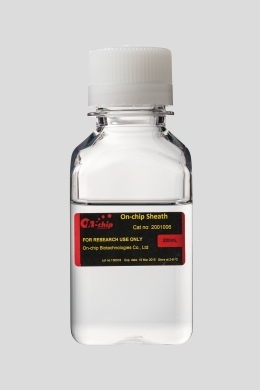 When analysis/separation by On-chip Flow / On-chip Sort, using the optimal buffer for the cell, you dilute this Reagent with the buffer and use as sheath liquid. It prevents a cell’s sticking to a chip or a tube and losing. In various cell experiments, by adding this agent to a buffer, coating a chip and a tube beforehand, the cell adsorption will be prevented. During measurement and sorting in On-chip Flow/Sort, dilute this product with culture medium or buffer to use it as sheath fluid. It is sheath liquid of Ready-to-use. “Through pass plus” of the prevention from cell adsorption is included beforehand. Moreover, since non-serum cell preservation liquid is used, it is sheath liquid with few damages to the cell. 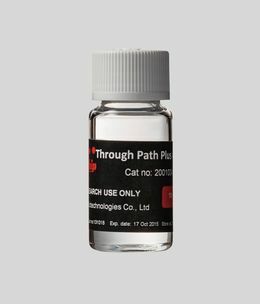 Sheath fluid consisting of Through Path Plus 40x diluted 40-fold with proprietary serum-free cell preservation fluid. Preparation is not required. Cells sorted with this product can be stored in a refrigerator for a few days. During measurement and sorting in On-chip Flow/Sort use this as sheath fluid. Also, coating a chip or tube with this product prevents cells from adhering. Use this as a sheath fluid and sample buffer. This is a mixture close to a culture solution, so open it in a clean bench. Sample buffer is buffer included PVP in order to suppress sedimentation of a cell. There are two kinds of sample buffer. 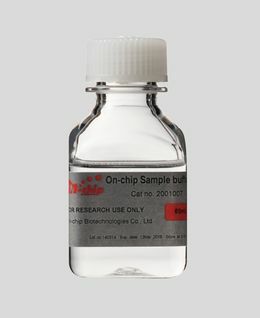 One is “On-chip Standard Sample Buffer “, it is Ready-to-use, included “Through pass plus” of the prevention from cell adsorption and non-serum cell preservation liquid beforehand. The other is “Sample buffer 2x “ , it is used by two fold dilution with the target buffer. Sorted cells can be stored in a refrigerator for a few days. Put the cells in suspension to produce a sample fluid. The PVP concentration must be accurately 1.5%, so rinse the cells two or three times with On-chip Sample buffer to replace them. PVP makes it difficult to centrifuge cells, so it is necessary to centrifuge at 1.5–3 times the normal speed. A solution for sample buffer preparation, containing 3% PVP. Wash the cells two or three times in a fluid diluted twofold with the intended medium, to replace and suspend them. Through Path Plus is not included, so it may be added if the application calls for it. The final PVP concentration must be accurately 1.5%.